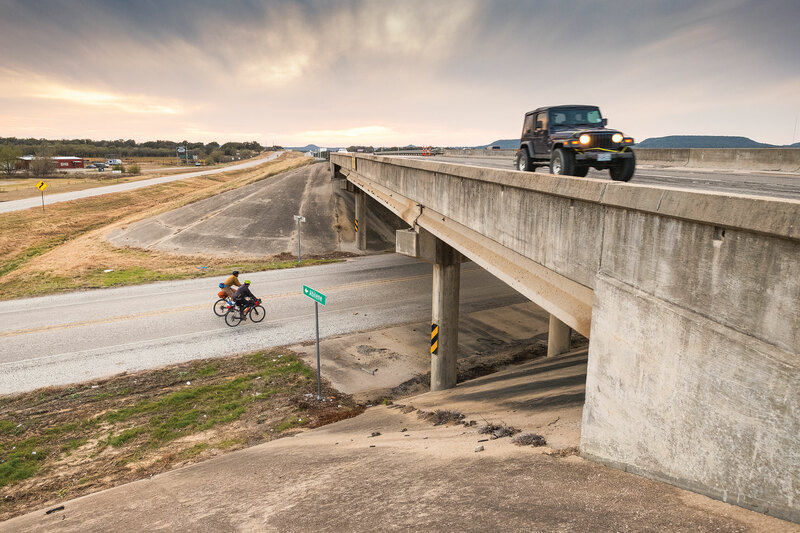 After class, Jerod rides home and secures his bike to the hitch rack of his Toyota FJ Cruiser, then drives across Lubbock to pick up his little brother. Seth, 29, loads his bicycle onto Jerod’s Cruiser, and they begin the five-hour drive to Mother Neff State Park to meet up with me. 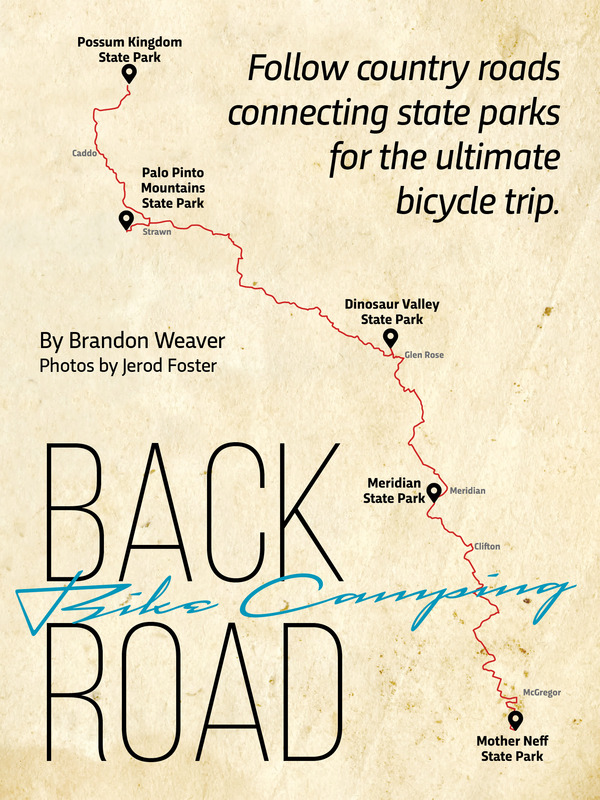 Our plan is to “bikepack” 223 miles from Mother Neff State Park to Possum Kingdom State Park. Along the way, we’ll camp at Meridian State Park, Dinosaur Valley State Park and, finally, the future site of Palo Pinto Mountains State Park. The route traverses as many gravel county roads between the parks as possible. We are taking the roads less traveled, which is the essence of bikepacking. 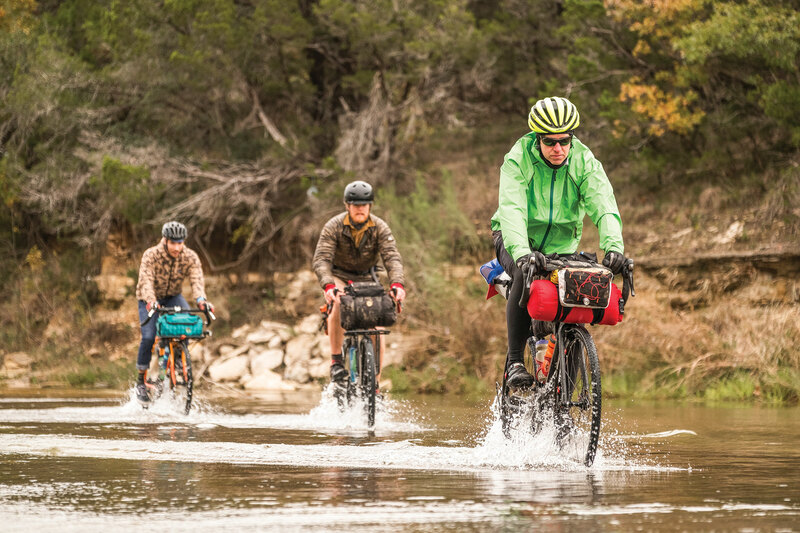 Bikepacking is the next evolution of bicycle travel. 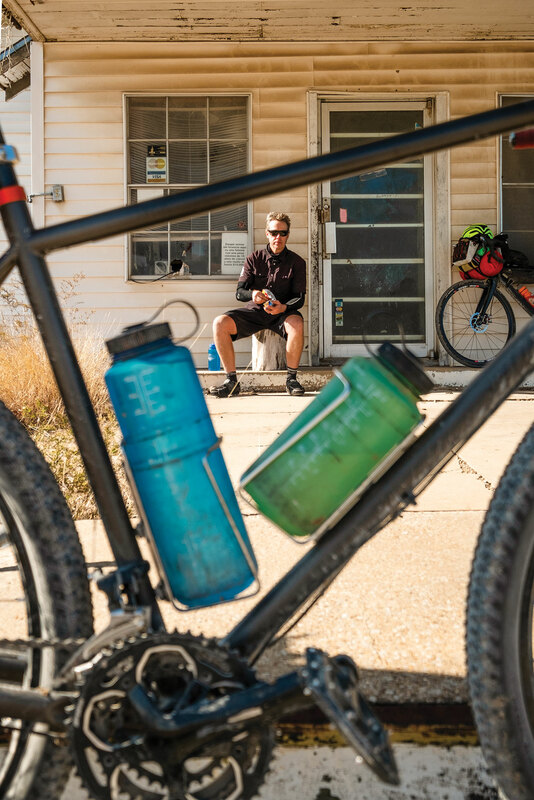 It differs from traditional bike touring by eliminating the need for racks. Bags are specifically sewn and engineered to fit in and around opportune spots on a bicycle’s frame, distributing the weight equally across the whole bicycle. The system is lighter, faster and more efficient than the saddlebags of yore. It’s late, and the campground at Mother Neff State Park is quiet. I curl up in my tent waiting for the Foster brothers to arrive. A prolonged roll of thunder briefly interrupts the dead silence. The Space X Rocket Development Facility is nearby. That “thunder” was the thrust from a rocket engine. An hour goes by, and headlights flicker off my tent. I hear car doors open and close, followed by voices. “Yep, I’m here.” I unzip my tent. We spend an hour talking and shivering in the frigid, dark night. We’re excited about the trip, but first we’ll need some sleep. Seth Foster, Brandon Weaver and Jerod Foster depart Mother Neff State Park. 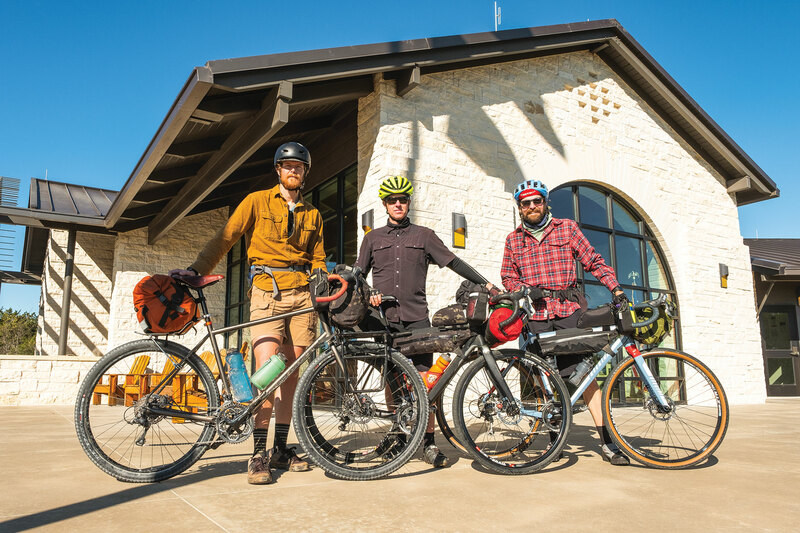 We load our bikes with our gear and ride through Mother Neff, a park rich with history. Civilian Conservation Corps Company 817 worked here from 1934 to 1938 building roads, trails and structures. Officially opened in 1937, Mother Neff was the first state park of the Texas system. We coast through Mother Neff’s limestone entrance, take a long loop around the Space X test facility and head out toward McGregor, stumbling upon a series of bunkers in a field just off the road. The bunkers, called igloos, are remnants of the Bluebonnet Ordnance Plant. From 1942 to 1945 the plant produced 13.5 million bombs and artillery shells for World War II. The site is now operated by Texas A&M University as a research farm. Our tires crunch across gravel on a road that zigzags through cultivated fields. As we cross the Middle Bosque River, the tree cover thickens as we proceed north. At Hog Creek, heavy timber hugs the road with thick brush proliferating in the dense woods. At mile 50, the road surface degrades, turning from gravel to cobbled rock and dirt. Seth wonders aloud if we’re still on a county road. The branches curve over us and obscure the sun, throwing thick shadows across the path ahead. Suddenly the woods come alive around us. Feral hogs burst through the fence line and run amok. “Look out, Seth, he’s coming for ya!” Jerod shouts as a small pig darts by. We stop and let the mamas and babies regroup. The wild snorting and squealing dissipate as the pigs retreat, and we all take a deep breath with some relief. Fifteen miles later, we stop for a quick dinner at the Clifton Quizno’s, inside Rangler’s Convenience Store. It’s nearly dusk, and we still have 10 miles to go — looks as though darkness will catch us. We finish our sandwiches, mount up, turn on our lights and ride out of Clifton. We spend the next hour cruising down a remote gravel road through a tunnel of trees. Jerod tells us about the time he saw an apparition in the dark on a road just like this, and my hair stands on end. We ride on and tell more ghost stories, our senses heightened in the darkness, not a car or another person in sight. We are blissfully exhausted. Arriving at Meridian State Park, we settle into our campsite for the night. Jerod and Seth roll out sleeping bags and “cowboy camp” under the star-encrusted sky. I need the perception of security, so I pitch my tent, crawl inside and crash. 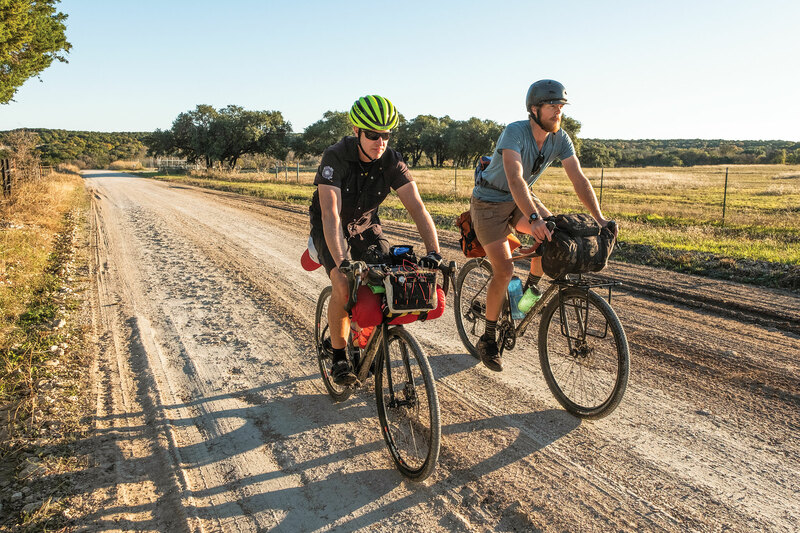 Weaver and Seth Foster ride a Texas back road near Clifton. In the morning, we loop 72-acre Lake Meridian, enjoying a rosy sunrise. Civilian Conservation Corps Company 1827 constructed the park in 1933 and 1934, building the impressive cut-stone refectory (featuring an open-air pavilion and arched entryways) that overlooks the lake. Day Two is relatively short, a nice mix of rugged gravel and buttery smooth asphalt surfaces. The weather is warm, and riding is easy. We roll into Dinosaur Valley State Park rejuvenated and ready for a longer day tomorrow. The evening air is mild, and the sound of flowing water is soothing at the primitive campsites near the Paluxy River. Everything feels right with the world. Jerod and Seth roll out their bags for another night under the stars, and I crawl into the comfy confines of my tent. At around 2 a.m. the walls of my tent begin to flutter violently as a biting north wind kicks up and the temperature plummets. We wake to an overcast day with temperatures hovering not far above freezing and ride straight into that north wind. Crossing the Paluxy River near Dinosaur Valley State Park. Riding under Interstate 20 east of Gordon. Country road traffic near Morgan Mill. Jerod carries two camera bodies and two lenses in a large hip pack around his waist, and in today’s dreary chill, he’s feeling that extra weight. He puts his head down and seems to give himself a little pep talk. Conversely, Seth’s wearing shorts and no gloves, and seems impervious to the elements. I’m cold but still feeling jovial. That changes as we ford the Paluxy River at a low-water crossing, my front tire throwing back a stream of icy water, drenching my shoes. The day just got a little more miserable. We stop in Bluff Dale for lunch. The town seems deserted, but we spy two hunters cleaning a deer at the processor. I ride up and ask one of them about lunch spots. “Jasper’s Cafe, up on the hill to your left,” he tells us, so we ride on up to the cafe. John Owens, proprietor, is on the front porch. His eyes light up when he sees us. He gives us the best table in the place, serves up some mouthwatering “exotic” burgers and treats us like rock stars. His warmth and our bellies full of hot food give us the jolt of energy we’ll need to keep pedaling in this weather. As we wait eagerly for our food, I notice that Jerod is so cold that he can’t stop shivering. I confess to them that I haven’t had a chicken-fried steak in nearly four years. Seth is aghast. “That’s too long!” he exclaims as I happily and hungrily break my streak and dive headfirst into crusty meat and cream gravy. Something about riding a bike all day makes food taste even better. Thawed out and filled up, we head west out of Strawn on FM 2372, cloaked by the shadows of surrounding mesas in the slanting light of late day. It feels as if we’re riding into the abyss, but four miles later, the road ends at our private campsite at the base of Tucker Lake dam, with special permission from the Palo Pinto Mountains State Park superintendent. The next morning, we hike to the top of the dam and look out over 91-acre Tucker Lake, cradled in a cove, with high bluffs and mesas flanking its shores. Live oaks line the hills, along with cedar elms and junipers, in this spectacularly wild place. We stand on the dam and daydream aloud about ways to turn the property into a park, as the Texas Parks and Wildlife Department intends to do. I envision mountain bike trails all across the park; Jerod pictures campsites along the lake. Someday this will be one of the crown jewels in the Texas state park system. I know it’ll be worth the wait. Brandon Weaver finishes off a bag of chips at an abandoned gas station in Caddo. We ride back into Strawn to find that the only option for breakfast is a Pac-A-Sac. I peruse the aisles and come up empty, so I decide to cook something up right there on the sidewalk. I crouch over my camp stove and wait for the water to boil. A woman walks up and asks, “What ya got there?” I stand up and tell her it’s oatmeal. She tilts her head, nods and then walks inside. I see Jerod and Seth through the glass, settled into a booth with a cornucopia of packaged pastries and snack food spread out on the table. I pour boiling water into my sensible oatmeal packet, add some peanut butter, stash my hot stove and pot underneath my bike and join them. Seth pushes pack from the table with a shake of his head. Jerod and I laugh with him. We know how he feels. Hunger is a driving force when you generate your own momentum. You’ve got to feed the beast. Our tour ends today with a short 38-mile ride to Possum Kingdom State Park. It feels appropriate to stop where the road ends, as the mighty Brazos River impedes further progress. Jerod has a saying he likes to share with his students: “The world has know-ers and do-ers, but you’ve got to be both to make things happen.” This gravel road tour wasn’t always easy and comfortable, but with good preparation and a bit of fortitude, we had a great adventure, and we’d definitely do it again. 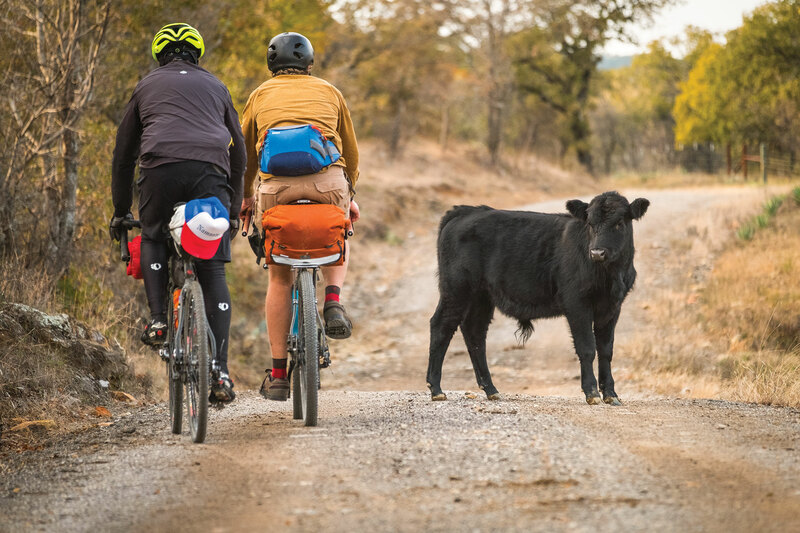 There are so many possibilities for great bikepacking journeys along the backroads of Texas. Find a state park, find a country road and find an adventure for yourself. Brandon Weaver is a freelance writer roaming the country with his wife, dogs and Airstream.